Homepage. This page: An interesting line-up, that features a couple of Albion lorries plus a Model T truck. Albions used by the Staffs police force. "The photograph shows the Staffs County Police MT fleet, maybe all of it for all I know, and looks to be in the 1920s and maybe was taken in The Friars in Stafford, but that's a guess. 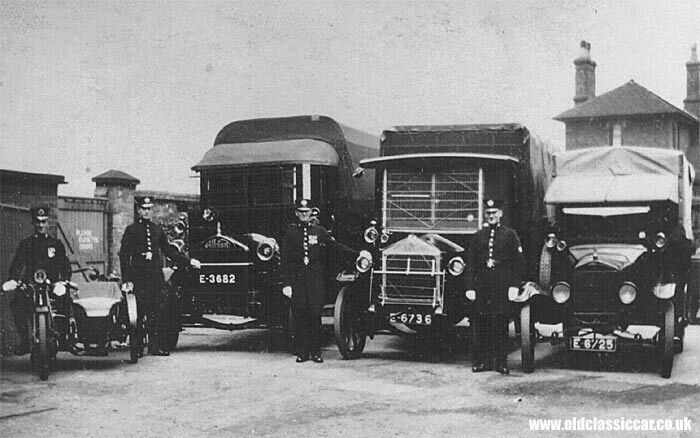 The vehicles with four wheels are an Albion lorry, what I think is another Albion lorry with screens up to prevent damage from thrown objects, and a Model T Ford. Another ex-Staffs copper I know said that the police used to live in "tied cottages" or single men in the barracks at that time, and that the lorries were used for moving the furniture and effects of policemen who were transferred to different locations, and often the first thing that the man knew about his transfer was when the lorry turned up to move him! I don't know if that's 100%, and the gear on the right hand lorry suggests that it was used to move squads of policemen about into scenes of disturbance. I have seen similarly equipped cars and trucks in old photos of the general strike in 1926, and bearing in mind the number of coal mines in Staffordshire then that could be why E6736 is so fitted." Two original letters issued by the Albion Motor Car Company Ltd in 1929 can be found on this page, within the motoring collectables section of OCC.